I look forward to December for the entire year, mostly because of Christmas, but also because I was born in December. I love all the sweets and treats and birthday cake. I feel like I get to celebrate the entire month. My grandmother made my favorite sweet…Forget-Me-Not cookies. She only made them around Christmas and her special twist was to add a little bit of peppermint extract and green food coloring to make them more festive. I couldn’t wait to get to her house and have my fill of those light and crispy cookies. My grandmother passed away a couple of years ago and since I haven’t had them in a while, I was excited to try to make them. Unfortunately I didn’t have her recipe. So after a little research and practice, I came up with a recipe that is really more of a meringue than a Forget-Me-Not which got its name because you place the cookies in a pre-heated 350 degree oven then turn it off and forget about them for at least six hours. 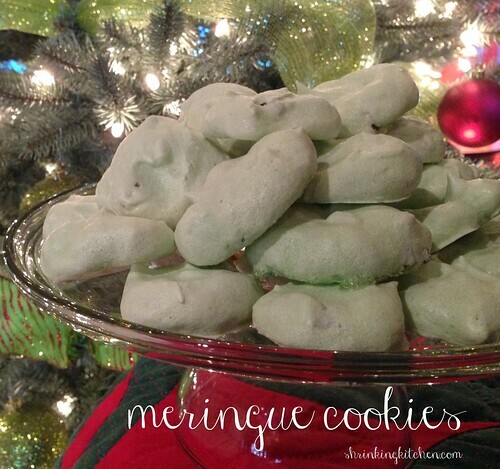 Meringue cookies are crisp throughout while Forget-Me-Not cookies are crispy on the outside and a little chewier on the inside. I’ve included the cooking instructions for both. After several failed attempts, I came up with this recipe. I think it tastes and looks so much like my grandmother’s. I’ve also lightened it up a bit by adding less sugar than any of the other recipes I’ve read. And the only fat in the cookies comes from the chocolate chips. These are really easy to make and a hit with all of my friends. Preheat oven to 225° (200° for convection) for meringue cookies or 350° for forget-me-not cookies. In a medium bowl, beat the whites at low speed till frothy then turn to high speed and mix till firm peaks form when the beaters are lifted. This took me between 5-10 minutes. The meringue tends to set quicker if the egg whites are at room temperature. Oh…whatever you do, don’t use the egg whites from a carton; they just don’t set up very well. Fresh eggs are the only way to go. Beat in the sugar a couple tablespoons at a time until all the sugar is incorporated. 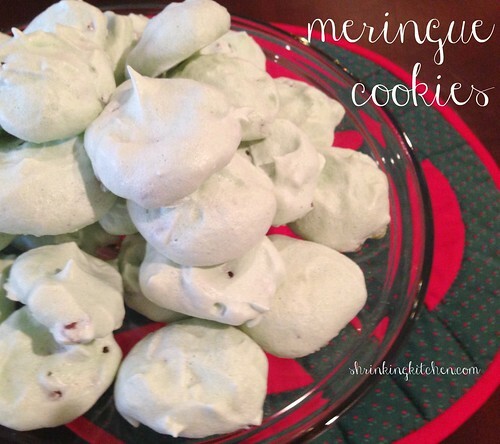 Then beat the peppermint extract and about 15 drops of green food coloring into the meringue. Spoon tablespoons of meringue onto parchment lined baking sheets. I tried piping the meringue but found that the chocolate chips clogged the piping bag. Bake for 1 hour 15 minutes at 225° (200° in convection oven). Place baking sheets into preheated 350° oven, close oven door and turn the oven off. Leave the cookies in the oven till the oven and cookies cool completely – no peeking. Just “forget” about them.